Islamabad (AFP) – Pakistan’s politicians, including PM hopeful Imran Khan, are mainstreaming extremism by invoking hardline issues like blasphemy to get votes, analysts say, warning the tactic could deepen sectarian fractures and potentially spill into violence. 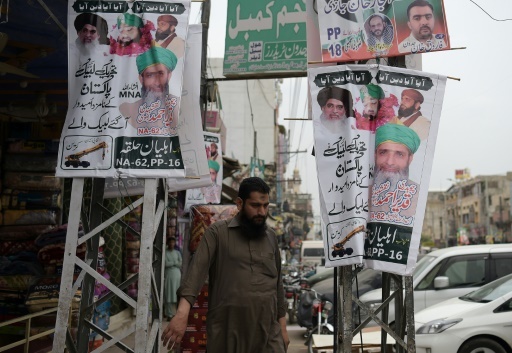 The warnings come as Pakistan confronts anger over a new wave of militant attacks which have killed 175 people at campaign events ahead of nationwide polls on July 25. The country’s long-persecuted religious minorities are on their guard as a result. “Previously it was only a bunch of extremists spreading hatred against Ahmadis,” said Amir Mehmood, a member of a community which has long been targeted by extremists in Pakistan, particularly over blasphemy. Ahmadis consider themselves Muslims, but their beliefs are seen as blasphemous in most mainstream Islamic schools of thought. They are designated non-Muslims in Pakistan’s constitution. AFP / Gal ROMA. 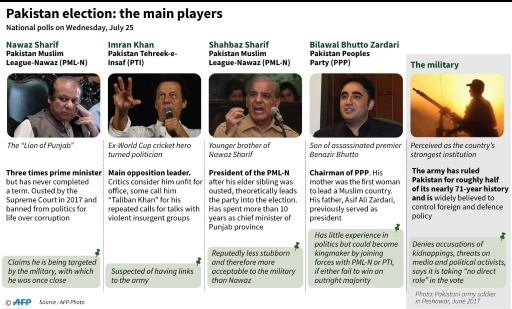 Pakistan election: the main players. 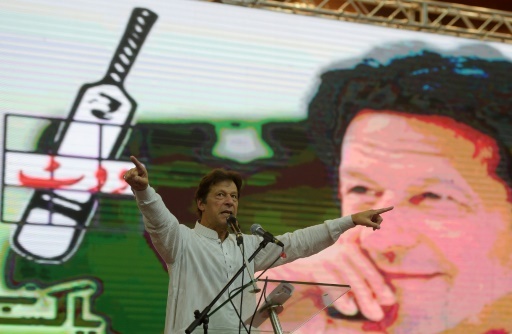 Khan, the cricketer-turned-politician who is the main challenger in the election, has caused concern in recent weeks with his full-throated defence of Pakistan’s controversial blasphemy laws, which carry a maximum penalty of death. It is a hugely inflammatory charge in Pakistan. The state has never executed a blasphemy convict, but mere accusations of insulting Islam have sparked mob lynchings and murders. International rights groups have long criticised the colonial-era legislation as a tool of oppression and abuse, particularly against minorities. In recent years, it has also been weaponised to smear dissenters and even politicians. The topic is so incendiary that mere calls to reform the law have provoked violence, most notably the assassination of Salmaan Taseer, the governor of Pakistan’s most populous province, by his own bodyguard in 2011. The assassin, Mumtaz Qadri, was angered by Taseer’s reformist stance on blasphemy. Feted as a hero by hardliners, he was executed by the incumbent Pakistan Muslim League-Nawaz (PML-N) government in 2016, provoking Islamist fury. Now Qadri’s image is being used on election banners, and some of Khan’s candidates are asking Pakistanis if they plan to vote for “the party who executed him”, placing themselves firmly on the side of Islamists. At one rally in Islamabad this month, Khan told clerics in televised comments that the PTI “fully” supports the blasphemy law “and will defend it”. “No Muslim can call himself a Muslim unless he believes that the Prophet Mohammed is the last prophet,” he said — a statement that raised alarm among Ahmadis, who are persecuted for their belief in a prophet after Mohammed. He predicts this change would deepen sectarian divides, empower radical groups, and could provoke violence. AFP / AAMIR QURESHI. TLP election posters feature images of Mumtaz Qadri (top 2nd L), who killed a provincial governor over his liberal stance on blasphemy. Khan may simply be trying to target the PML-N with his comments on blasphemy, says minority activist Kapil Dev. But when the potential next prime minister of the country shares an inflammatory stance with extremists, “people take it seriously”, Dev warned. Jibran Nasir, a prominent human rights activist running as an independent candidate in the southern city of Karachi, is already facing threats over the issue. Islamist hardliners stormed his election events and warned him not to campaign in the area over his refusal to denounce Ahmadis. In a video posted online, one cleric in Nasir’s constituency is seen referencing the assassin Qadri in a threatening speech. 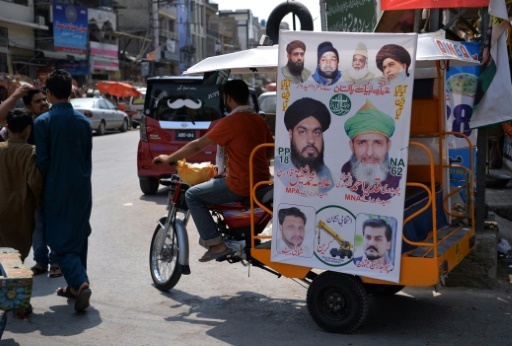 Organisations like Tehreek-e-Labaik Pakistan (TLP), which blockaded the capital Islamabad for weeks last year over blasphemy, are widely contesting the polls. The party’s chief, Khadim Hussain Rizvi, reportedly told journalists in Karachi that if he took power in the nuclear-armed country he would “wipe Holland off the face of the earth” over cartoons of the Prophet Mohammed. AFP / AAMIR QURESHI. Analysts say mainstream political parties are also exploiting the religious narrative. Other radical groups contesting the vote include Sunni sectarian extremists Ahle Sunnat Wal Jamaat (ASWJ), and the Milli Muslim League, linked to Hafiz Saeed, the man accused of masterminding the 2008 Mumbai attacks. “If we get power in the evening and if a single Shia is alive by the morning in Pakistan then change my name,” ASWJ leader Muhammad Ahmed Ludhianvi told an election rally. Both groups have been banned from the election but their candidates are contesting under the banner of other, lesser-known parties. The analyst Rana suggested PTI and Khan may also be trying to weaken the appeal of radical religious groups by co-opting their rhetoric. But if he really is seeking to cut support for these parties, it will only increase the appeal of extremism, warns the Ahmadi activist Mehmood. 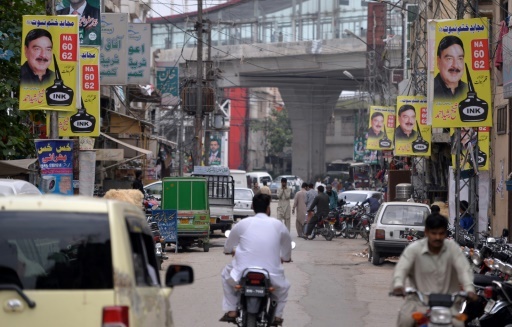 In his town of Rabwah in central Pakistan, a hub of the Ahmadi community, residents say not one politician has visited its 40,000 registered voters this campaign season. Featured Photo: AFP / AAMIR QURESHI. Election posters of one of the candidates of a Sunni Muslim religious party feature an image of the police guard who killed a former Punjab governor for his liberal stance on blasphemy. Gohar Abbas is an Agence France Presse correspondent in Islamabad. Islamabad, covering Pakistan and Politics. His work has also appeared in Business Insider, Yahoo, France 24, Times of Israel, La Presse, Arab News, ABS-CBN News, Gulf Times, The Citizen (South Africa), and The Peninsula Qatar.